I am new to the forum and my main interest is 20's battery radios. I am starting to feel like it was an unfortunate choice as it seems there isn't much interest among current radio collectors/restorers in these radios, which means there isn't much help for someone like me who is fairly new to this hobby. I was wondering how many users of this forum have any interest in the radios of this era? Battery radios found me in '63, when an estate was given to me. My early communication with other collectors began in '74 either at meets or through publications. I still find them intriguing, especially the not so common RF sets and reflexes, in particular well crafted homemade or kit receivers. There are a lot less battery tube radios in that vintage, just because of the invention of Radio had no commercial stations to start with, one was located in Madison WI. As an experimental University broadcaster WHA. The other was KDKA the only other one that started after WHA. Most receivers were home built or kits to start with, farmers started getting interested to hear local farm news, and weather forecasts. Since most rural communities had no electrical power available the only way was to use batteries. I imagine most radios were quite costly and therefore out of the average persons cost. I have no knowledge of production numbers. As you have a interest you may find that even newer sets have the same basic functions and wiring. So if you need assistance in troubleshooting were do have some help here. Don't be discouraged as there are many books from that era that deal with problems encountered. There are other forums such as RadioMuseum.org and Antiqueradio.com. are another resource. Welcome to our forum, and participate in several different topics as your interest increases. I have had a lifelong interest in the 1920s broadcast radios starting when I was a teenager after I got a start in ham radio. I was one of the younger collectors at the time when most of the fellows were much older experienced radio men and such. I am 61 now. I began collecting radios, tubes-lots of 201A tubes, literature, test equipment and so on so if you have any questions or want help just ask here on the forum. I don't have a lot of radio stuff now after a major move from back east but I still have the interest. I have recently got back into the hobby and have picked up a couple of Freed-Eisemann sets-one of my old favorites. I hope to get another finances pending. I have also started looking around for the battery tubes like my favorite the fairly common Cunningham CX-301-A. There were also a lot of independent tube manufacturers out there back in the 20s and 30s and finding them is part of the fun too. I have picked up some 201A types recently-with mixed results. Some of my tube buys have turned out to be very good. Others not so good-weak tubes or arriving with shipping damage-broken envelopes, shorts or open filaments, etc. There seems to be a wide variability in the quality and suitability for use of these tubes but this has been the case since I started picking them up more than 40 years ago. Amazing that they still work after nearly 100 years! So since the tubes can very so much some experimenting is necessary in trying them out in the various sections and sockets of the receiver to see where they will function best. My past experiences here: the better, hotter tubes are needed in the RF amplifier section. Next best in the detector socket, and then the lower quality ones seem to do ok in the audio amp section of the receiver. This varies of course so if you get squeaks and oscillations and motorboating and what not you might need to shuffle them around some more or try some other tubes. I enjoy testing tubes and think grading the tubes helps and bears out in actual radio performance. I just picked up a nice WWII vintage Hickok 540 tester which is very good for the mid 1940s and earlier type of tubes it was designed for. It is also fun to use. I don't have much test equipment at present but I hope to pick up some. I am looking into condenser/capacitor checkers right now but haven't made a decision yet on what to get. It is hard to decide. So many different makes and models of checkers. A lot of them are basically the same circuit though but the features can vary. I recently picked up some parts, tubes, and chassis to fit the various Eico 950 models anticipating I might go in that direction. Radiotvphononut uses a Heathkit C-2 and Eico 950B with good results. It is fun to watch him at work. I've tried to find a C-2 but no luck so far. I did get a manual for one. So good luck and ask for help when you need it. Using a tube tester than can test for gas is helpful, gassy '01as can go in the detector if the detector supports a combination of separate filament control and easy access to the grid leak. A good RF generator that can get down to 50khz for the early supers is helpful, so is an old school audio scope. I did forensics on transformer failures and found that corrosion is about 25% and (blown open) about 75% of the time. The blown ones are from use of the radio during electrical storms where the amp is operating at maximum, the abrupt cutoff of the tube from the static pulse causes a high voltage kickback in the transformer burning open. Forensics found microscopic copper balls and the ends of the wire rounded from the arc. Acids from the arc eaten through to the above and below layer. Sets that have "C" batteries stored in the cabinet generally will have a higher incidence of bad transformers too. The tar battery sealant contracts and the fumes creep into the tender windings. I sold my place and moved out of Lyncburg, Virginia about 6 1/2 years ago to Oroville, CA where I still have some family. I had a pretty good radio setup back in Lynchburg. 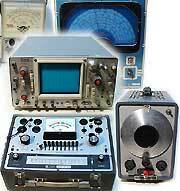 Lots of test equipment, parts, tubes, boatanchors, microphones, am/cw transmitters, manuals, radio literature and so on. Also some older sideband gear like RL Drake. Military, commercial and older ham equipment made up most of the gear. I was frequently on the air on AM Phone at 3885 kHZ-almost a nightly fixture in fact. I had a good supply of the older tubes and parts going back to the 1920s in Lynchburg but just a very limited supply of battery sets of the 1922 to 1926 era. I did have a working 1927 RCA Radiola 18, a Radiola 33, a couple of RCA R-100A speakers, and Atwater Kent cone and horn speakers. I was mainly concentrating on short wave, war surplus and older ham radio gear at that time. I got into collecting battery sets probably around 1970. I built up a fairly good collection for a young person on a limited budget. I had a friend, (Bill Wakefield) that I went to the CHRS meets with when I was living in the Bay Area (1970s). We used to go up to see Paul Giganti who was a well known collector at the time and an early AWA member. Paul was also a very knowledgeable dealer in antique radios and I bought quite a few sets from him including my first tube checker that was a WWII vintage Navy Hickok 550X. I used to frequent some of the radio surplus houses that were in the bay area back then. In addition to the CHRS meets I was able to make the trip to a few of the Southern California Antique Radio Society (SCARS) meets. I also started going to hamfests about that time which was a real boon to collecting. Well, I have fun watching some of the youtube radio repair videos. RADIOTVPHONONUT is my favorite and his channel name gives one a good clue on what he likes to fix. I guess he is in his early 40s. Nowadays, I would call him a young person to be in this hobby. He does not appear on camera but his narration is good and his stories are interesting-he would be a good one on 75 meters AM Phone. I don't know if your familiar with the Gernsback publications of Radio Service Manuals, so I am providing a link to you to Help. The first volume has Atwater Kent Schematics and some Instructional comments. I have not found a battery set of that vintage close to my Location, But there are a few Radio Clubs that are active in Tacoma and Seattle areas. I do have a RCA Radiola 60 ( 1928 ) that I got several years ago, decided to strip off the cabinet and only used acetone and # 400 steel-wool.There was enough Lacquer still on the surface that wiping it with a cloth provided it with a beautiful finish. That was my first project. I never got around to testing it or repairing it. Its a dust collector right now but it still is on my TO DO list. Here's a link to a member discussion on a Neutrodyne needing a solution and being solved! Thanks for the link Cliff. I have heard of the famous Gernsback manuals. I have an original Atwater Kent service manual I use but I have found you can never have enough resources.